Immediate payment of £209.99 is required. Their after sales service has been excellent. Excellent packaging and delivery. Will use this supplier again. A****, Fast Dispatch, Works perfectly as described, great condition. Everything just as described! Fast delivery. Reliable seller. Great sound and handy to have your library at a touch already downloaded so that you can listen to or watch what you like without worrying about wi-if or Bluetooth dropping out. The sound isn’t the best but I can get all my older music onto the iPod. It doesn’t interfere with phone calls and was the best birthday treat to myself. 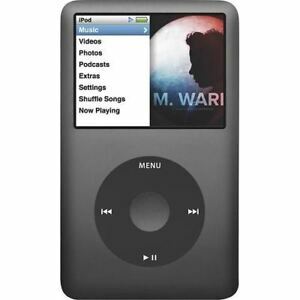 iPod classic is a really classic.